The 1999 Honda Valkyrie Interstate for sale has a Flat 1520 cc six cylinder engine, trunk, bags, stereo, intercom system, full body fairing, dual headlamps, crash bars, highway pegs and less than 20k miles! The Interstate has a beautiful green and silver paint color scheme and is in "like new" used condition. It's powerful, runs smooth as silk and will smoke any Harley out there! This Honda Valkyrie for sale is one of the nicest Interstates you will find for the price but I don't have time for tire kickers, so please don't call unless you're a qualified and serious buyer. It runs smooth as silk with no problems at all! 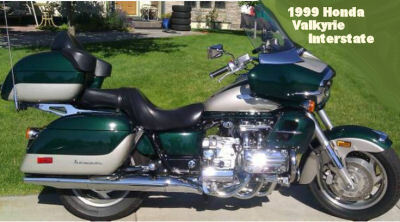 It's just an awesome Bike that probably won't stay on the market long since the Valkyrie Interstate was only produced from 1999-2001 and it's getting harder to find a nice one with low mileage like this one. The Honda for sale is located in Meridian near Boise ID Idaho and my asking price is $9250! You can reach me by calling (NO EMAILS OR TEXTS) five seven one one 9five five to make an appointment, request pics or to ask any questions (and don't forget to mention that you found this ad on GoGoCycles Motorcycle Classifieds gogocycles.com). GoGoCycles Used Motorcycles for Sale would like to invite our visitors who are having problems with their 1999 Valkyrie Interstate to leave a description of the problem that you are having to see if somebody who stops by might offer a solution or give you some advice on how to fix your bike (and DON'T FORGET to leave your contact information in case they need to get in touch with you). If you are having trouble finding Honda Valkyrie parts, you can post what it is that you are looking for that you need to repair your bike. AND it would also be helpful if you would write a review of the 1999 Honda Valkyrie Interstateto make others aware of any problems common to this bike or to list its positive features, make recommendations for desirable accessories or anything else you think we should know. We encourage you to submit your opinions and write reviews of the Honda Valkyrie for sale in this ad if you have had experience with it, not to kill the motorcycle's reputation or to give it a poor rating but to help potential buyers make informed decisions and to benefit the biker community as a whole.